Galway Metals: Step Out Drilling Intersects 14.6 g/t Au over 10.2m and 7.3 g/t Au over 4.6m Near Surface at Clarence Stream North Zone - Galway Metals Inc.
(Toronto, Ontario, July 18, 2017) – Galway Metals Inc. (TSX-V: GWM) (the “Company” or “Galway”) is pleased to announce assay results from 31 diamond drill holes (5,302 meters) at its Clarence Stream gold property located in south-western New Brunswick, Canada, drilled in and around the North Zone. Since the Company entered into an option agreement to acquire a 100% interest in the property on August 3, 2016, 69 holes have been drilled and results from 57 holes have been reported. On May 31, 2017, Galway announced that it had contracted SRK Consulting (U.S.), Inc. to undertake a maiden pit constrained resource estimate and updated underground resource estimate to unlock potential of near-surface, high-grade gold mineralization, which is scheduled for completion by the end of September. 16.6 g/t Au over 2.1 m, including 32.7 g/t Au over 1.0 m starting at a vertical depth of 28 m.
The North Zone step out drill program was designed to add to potential near surface resources by drilling many short holes covering a large area between previously-drilled and well mineralized zones (Figure 1). All three holes noted above, and a previously reported intersect that contained 2.8 g/t Au over 14.0 metres, including 56.2 g/t Au over 0.6 metres (March 28, 2017), are located approximately midway between the 550-metre gap that separates the main North Zone resource from a smaller zone to the southeast that is not currently included in the resource. Another zone 840 metres southeast of the main resource, which contains 5% of the existing resource, will be the target of a future drill program, both to link up and extend the zones. Also of significance in Galway’s recent drill program are the intersections of 4.7 g/t Au over 1.0 m and 1.2 g/t Au over 5.1m that are located 200 metres northeast of the 2.8 g/t Au over 14.0 metre intersect noted above. The three holes contain similar mineralogy, indicating that the intervening area and areas further northeast are potentially mineralized. Holes 106, 108 and 112 (results below) indicate good mineralization in the 400-metre gap area north-south between the intersections in holes GWM-17-113 and GWM-17-114 and the smaller zone previously identified by the former operator. The zone dips at shallow angles to the east. These gaps will be drilled in the future. All of the strongly mineralized intercepts are located along a strong soil anomaly trend that runs southeast and continues for 2,800 metres to the South Zone, with no drilling having yet been done. 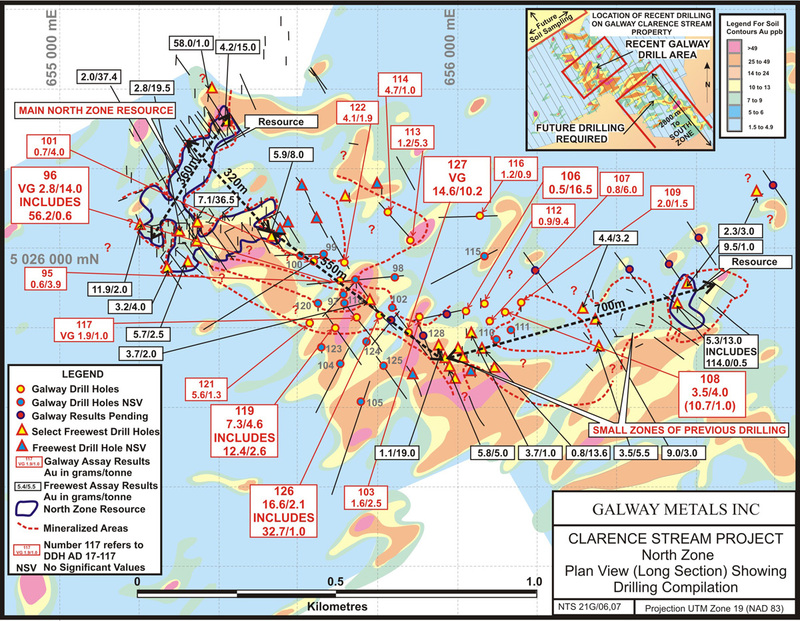 Along this trend to the northwest, there has been no soil testing or drilling; this will become a priority for Galway, especially since the northern-most hole in this area, and indeed anywhere on Galway’s property, intersected 58.0 g/t Au over 1.0 metre in a hole drilled by a former operator. The main North Zone resource hosts drill intersects such as 2.0 g/t Au over 37.4 metres, 7.1 g/t Au over 36.5 metres, 2.8 g/t Au over 19.5 metres and 4.2 g/t Au over 15.0 metres, while the small zones host intersects such as 5.8 g/t Au over 5.0 metres, 1.1 g/t Au over 19.0 metres, 5.3 g/t Au over 13.0 metres, and 9.0 g/t Au over 3.0 metres. North Zone Indicated and Inferred Resources, cut at 30 g/t Au, amount to 186,000 tonnes grading 7.6 g/t Au for 45,000 oz plus 235,000 tonnes grading 6.4 g/t Au for 48,000 oz, respectively. On uncut bases, respective Indicated and Inferred Resources amount to 51,000 oz at 8.5 g/t plus 70,000 oz at 9.2 g/t. This North Zone resource accounts for 22% of the total resource at Clarence Stream. The full resource can be found on our website at www.galwaymetalsinc.com. The drill has been mobilized to the South Zone to expand the current underground resource with the first pit-constrained resource, which will also include an underground component. The drill is expected to be moved again in August approximately 5-km to the southwest along the Sawyer Brook Fault to follow up on earlier resource-grade drill intersects on ground previously owned by Jubilee Gold. The North Zone warrants future drilling to fill in gaps and extend the zone, which is open in all directions. Galway Metals would like to acknowledge financial support from the New Brunswick Junior Mining Assistance Program, which partially funded drilling of the shallow, high-grade holes that are being followed up. No top cut has been determined for this new area in the North Zone, pending the delineation of the proper top cut from the current SRK resource estimate being undertaken. The 14.0 metre intersection in AD17-96 is the width of the quartz vein zone. The grade of the middle portion may not have sufficient grade to carry both contacts (it averages 0.4 g/t) but is included here because the distribution of higher grades may not always be on the outside contacts. The appropriate lower cut-off grade for potential open pit mining has not yet been determined but Galway has been applying a 0.5 g/t cut for illustrative purposes. Drill holes AD17-97 to 100, 102, 104, 105, 110-111, 115, 118, 120, and 123-125 did not return significant assays. No top cut has been used pending the delineation of the proper top cut from the current SRK resource estimate being undertaken. Clarence Stream is located along, and controlled by, the Sawyer Brook Fault boundary of the Gander and Avalon terranes of the Canadian Appalachians in Palaeozoic age intrusive and sedimentary rocks, which are the primary hosts of gold mineralization. The deposits are intrusion-related quartz-vein hosted fault-controlled gold with pyrite, base metal sulphides, and stibnite plus anomalous concentrations of bismuth, arsenic, antimony and tungsten, with sericitization and chloritization. Gold is present in two main areas—the South Zone along the Sawyer Brook Fault and the North Zone 3.5 km NW. The South Zone is steeply dipping, east-northeast trending, with two horizons identified to date, and multiple shoots extending over more than 2 km and drilled to a depth of 350 metres to date along contacts and within sheared and altered metagabbro and microgranite sills and dikes that crosscut the meta-sedimentary rocks and are related to the Saint George Batholith to the south (presence of hornfels + veined and altered auriferous microgranite dikes + high concentrations of Bi, As and Sb). The North Zone consists of five lenses within a one km by two km area, is hosted within metagreywacke and argillite, with its resource in a bowl-shaped structure ~ 3 metres thick (at a 3 g/t Au bottom cut) from surface to 100 metres, and in quartz with stringers and semi-massive stibnite, arsenopyrite, and pyrite.